No new snow, but not a problem. Taos was a 2 hour haul from Santa Fe, and was well worth the trip. I can imagine it's even better when covered in fresh snow, but it was still a skiers haven. It was as steep as they say. 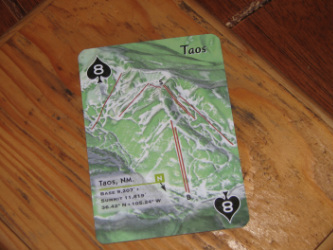 The first day I skied Taos, I spent the afternoon getting to know the mountain, which was no easy task. Some how I kept getting dumped out onto blues and greens. No one likes to be looking for some serious "gnar" and end up on blue run called bambi. So if you go, I recommend going with someone who knows the place, so you can get right to the goods. Or if you're skiing alone, like I am, you should probably act as pathetic as possible and try and convince someone local to take you around. Which is what I did. And it's such as small world that it turned out we shared mutual friends. So on his break, he showed me around the mountain and it was so much better than having a go at it alone. It was like I was almost there, I was doing the right trails, but I wasnt breaking into the woods soon enough, or I was just missing the good stuff all together. We did a short hike up, and skied some good stuff, which I also would not have had a go at alone.